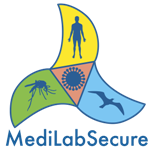 The MediLabSecure project includes the creation of a network of medical entomology laboratories in the 19 non-EU countries from the Mediterranean and Black Sea regions. Vectors responsible for transmission of Dengue, Chikungunya and Zika virus to humans are Aedes aegypti and Aedes albopictus. The impact on human and horse health of West Nile Fever, transmitted mainly by Culex mosquitoes, recently and dramatically increased in the Mediterranean and Black Sea regions. Involving several mosquito and vertebrate species, WNF epidemiology is complex and a lot of research and training is still needed for a better understanding of its vector. Laboratories play a key role in the recognition of infectious diseases. The creation and the management of a network of laboratories specializing in mosquitoes and arbovirus transmision help in the identification of needs in participating countries in terms of monitoring, diagnostics and biosafety. 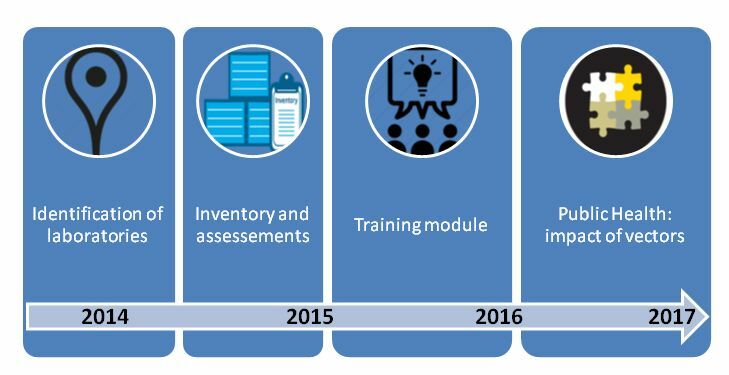 Training modules, visits from experts, identification tools, and workshops all help to assess the risks of different emerging viruses. Depending on the needs of each benificiary area, training and exchanges will be introduced. 8-12 June, 2015 - Faculty of Agriculture, University of Novi Sad, Serbia. MosKeyTool is an interactive identification key for mosquito species (larvae and females) suitable in the whole Euro-Mediterranean-Middle East areas. This tool freely downloadable can be used by expert as well as non expert entomologists. It provides the current knowledge for mosquito species determination of the 128 species in the area. Training follow-up and knowledge reinforcement activities were implemented, such as “MosPictoQuizz”. An entomology EQA was also performed and included all laboratories from the network. Permanent and reliable monitoring is essential for the implementation of effective prevention. One of the challenges of this network is to consider a concerted integration of surveillance systems for mosquitoes. A roadmap towards harmonization of entomological surveillance systems in the Mediterranean area regarding transmission risks of mosquito-borne viruses completes the strategic document on integrated surveillance of arboviruses in countries of the Mediterranean and Black Sea regions, as guidance to implement entomological surveillance in a comprehensive “One Health” framework. This group is led by Dr. Vincent ROBERT at MIVEGEC (IRD).